How many of the 300,000 British citizens diagnosed with cancer this year will receive an innovative treatment? The answer, according to the awesome House of Lords Library, is 5.6%. 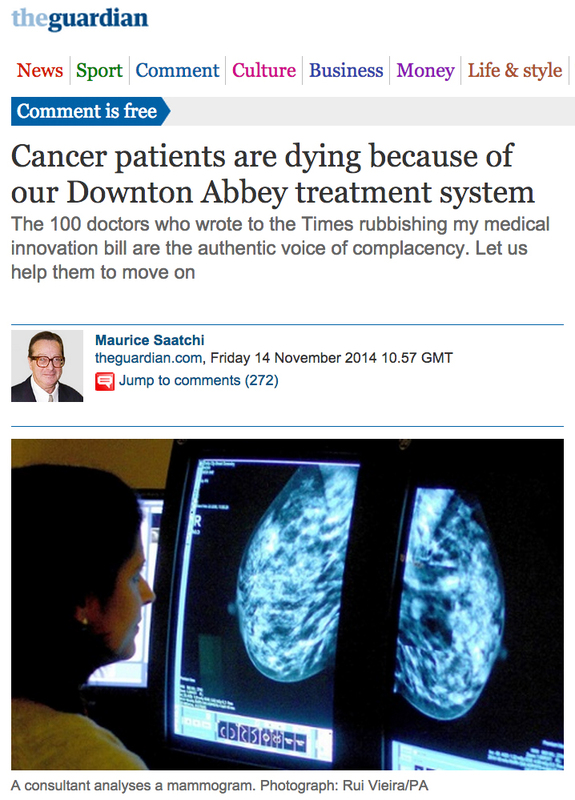 In other words, 94.4% of Britain’s cancer patients will receive only the standard procedure. In the endless repetition of a failed experiment, 165,000 of them will die. You would need a fleet of JCB’s biggest excavators to dig the mass grave for this year’s cancer dead. This is why I proposed the medical innovation bill, which is now before parliament. If passed, it will allow doctors to try reasonable innovative treatments, so long as they have the agreement of the patient (or patient’s representative) and of a panel of medical specialists. The bill has the support of No 10, the secretary of state for health, the UK chief medical officer, the government’s chief scientific adviser, the medical director of the NHS, Britain’s top judges and 20,000 respondents to the government’s public consultation on the bill. But it is opposed by 100 doctors, who wrote a letter to the Times this week [paywalled link] saying the bill is rubbish. How I pity their patients. Theirs is the authentic voice of complacency and self-satisfaction, as in one of their quotes: “It is time that people listened to the experts.” These doctors sound like Lady Ludlow in Elizabeth Gaskell’s novel Cranford. She objected to the education of poor people on the grounds that “it is becoming common for the lowest class to have some education … the proper order of the world will be undone.” The doctors may not have realised that the age of deference is over – not just in medicine but in politics and all walks of life. The “Times 100” insist that the only method of scientific advance is the clinical trial. Perhaps they overlooked the view of the forefather of the randomised controlled trial, Sir Austin Bradford Hill, who said: “Any belief that the controlled trial is the only way [to study therapeutic efficacy] would mean not that the pendulum had swung too far, but that it had come right off its hook”. Or maybe they missed the view of Professor Sir John Bell, regius professor of medicine at Oxford, who says there will be no cure for cancer “until real doctors with real patients in real hospitals can attempt an innovation”. What sort of people do these 100 people think we are? Are we downstairs in Downton? Are we supposed to doff our cloth caps as these doctors go past us in Harley Street in their horse-drawn carriages? They are living in another era. Our iPads can follow the proceedings of the American Society of Clinical Oncology conference in Melbourne at the same time as they do. Let us help them to move on. In the modern era, any half-decent protest movement such as theirs needs a logo. They say a picture tells a thousand words, so here is their picture – a shrug of the shoulders. That slogan will look good on a poster. Let them put it up in Britain’s hospices, where 80% of the patients – with a life expectancy of two weeks – are dying of cancer. Previous PostWhy the research community needs to rethinkNext PostWhy is research specifically excluded from the Bill?